The kitchen is a spot in your home where you keep your food and naturally, it can attract pests like ants. If you constantly find yourself with ants crawling all over the place, then you might have an ant infestation. With that problem, you should look for the best ant traps to successfully get rid of ants from your home. While there are many ways killing ants but we find ant traps are very effective and less harmful to the environment. To help you choose the best ant traps, we searched the internet and wrote some ant trap and ant bait reviews, plus a buying guide. You could use these in your kitchen and also in other parts of your home to solve your ant infestation problem. What to Consider When Buying an Ant Trap? What is the Best Way to Apply Ant Traps? Which Ant Trap to Use? What Are the Different Types of Ant Traps? Advion Ant Gel Insecticide with Plunger is one of the best-selling ant killers on the internet. It has a high rating and great feedback from users because of its effectiveness and quality. It’s an ant bait that you can ideally use indoors and is formulated to attract different ant varieties. It has a syringe-type applicator that allows you to reach into tight and hard-to-reach spaces in your kitchen, including cracks and corners. Its active ingredient is I﻿ndoxacarb which is a chemical pesticide developed by DuPont. It is considered a strong gel formulation so one tube will last more than one use. The downside from this ant gel is you might need to reapply once in a while and it can take time for the ants to swarm. But what makes it effective is when you apply it near ant trails. The ants will swarm over the gel and eventually take it back to their colony, spreading the effect of the poison. Overall, this is a very reliable and professional ant bait for a low price. It can target most ant species and all sweet feeders. Each comes with a pack of four and has 1.06oz each. Waantred Trap-It-Ant Trap is an outdoor ant trap that is best used as a hummingbird feeder. If ants are getting into your hummingbird’s food, then this is the best product to eliminate the ants. It is easy to hang with its hook and as simple to use as putting water inside the cup. The water is the one preventing the ants reaching the feeder. There is no ant bait or poison involved in this ant trap. The downside to this is it’s not ideal to use indoors, hence, it doesn’t really kill the ant colony by bringing back ant bait but instead preventing the insect from reaching the food tray. However, many users say how effective this is in keeping ants out of their hummingbird’s feeds. It is a very simple product and very easy to use but you cannot put ant bait in it because the hummingbird uses it as a feeder too. Overall, it is a very straightforward product that effectively keeps the ants out of a hummingbird’s water. 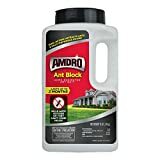 Amdro Ant Block Home Perimeter is an outdoor ant bait with a perimeter of as far as 540 feet from your home. It contains active ingredients that can successfully kill the colony within 2 weeks of application. It works with a delayed action to ensure that the worker ants have enough time to spread the bait to the colony. The Amdro ant bait is also suitable to use indoor. Especially for homes that have indoor plants, this ant bait is effective at preventing this little insect entering your home. However, due to the potency and strength of its active ingredients, this is not advisable to use around pets, livestock, or in vegetable gardens. But it’s strong enough to kill the queen and the entire colony including carpenter ants and 14 other ant species. In summary, this product is one of the best outdoor ant killers that can cover a large perimeter and works equally great in indoor too. It ensures that the entire colony is killed by delaying the effect of the chemicals and it’s very affordable too. Each bottle has 12oz of liquid ant bait in it. Maxforce Quantum Ant Control Liquid Bait by Bayer can provide fast control for different kinds of ant species that include Argentine ants, Pharaoh ants, ghost ants, black garden ants, etc. It has a clear and odorless formula that allows you to place baits anywhere safely. You can use it both indoor and outdoor, at home or commercial places, including food handling premises but only inside cracks and crevices. Unlike gel baits that lose moisture quickly, this liquid bait can last for about three months. Maxforce Quantum contains a low dose (0.03%) of Imidacloprid that can get rid of the entire colony, even those hidden in hard to reach areas. Many users love how effective this product and how they see results after just a few days, even with tiny amounts. For its price, it does a great job at eliminating different ant varieties and lasts very long compared to gel type baits. This product also comes with 10 plastic feeding station and each bottle contains 120 gram of liquid ant baits. This product also has tube option, find it here. 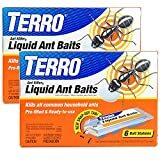 Terro Ant Traps is also one of the best ant traps on the market today. It is effective and can kill common household ants. Its bait stations are pre-filled in a tray and ready to use, making it more convenient for you to use in the kitchen or anywhere around the house. The baits have a patented design to ensure that it lasts longer and doesn’t dry out, making sure that the ants get to it and bring it back to their colony. Terro is designed to kill the worker ants within 2 to 3 days so that the foraging ants can share the bait with the rest of their colony. Using the Terro liquid ant baits is very simple and easy because it is ready to use. It is excellent for the kitchen especially if you have an ant infestation there. It does a great job of attracting lots of ants and you’ll guarantee to see the ants get less after a few days of use. The price is also very affordable solutions for insect control, and each buy comes in 2-packs. We go through hundreds of products listing at Amazon and also study the ratings left by previous buyers to find the best ant traps for you. Besides that, we also calculate the overall net ﻿﻿﻿customer satisfaction (NCS) grade because we want to see how happy is the previous buyers with their purchase of the product. From our finding, we can say that Advion, Amdro and Bayer are the best ant traps brands. These brands are popular and received many excellent ratings for their products. Also, the Advion Ant Gel Insecticide with Plunger, Amdro Ant Block Home Perimeter Ant Bait Granules and Maxforce Quantum Ant Control Liquid Bait score favorably for the ratings as well as the NCS grade compare to the rest. We believe that you would find these ant traps a good buy too. Ant traps are also called feeding stations. Sweet protein-based bait is used to lure in the ants into the trap to eat and eventually poison them. There are ant traps that can be used indoor or outdoor but there are some that are designed for specific use only. Ant traps are also seen as a cleaner and safer long-term solution for pest control to get rid of ants. When the ants eat the bait, they are poisoned slowly so that they bring some bait back to their colony and spread the poison to other ants too. The ants in the colony will also eat the bait which will slowly kill them as well. This makes ant traps a more effective and safer alternative than sprays because it can kill the entire colony, even the queen. When picking an ant trap, decide if it is attractive to ants and what kind of chemicals it uses if there are any. Attraction helps so much in luring in ants and if you are not using a potent attractant, then it is useless. You can’t kill the ants if you can’t attract them to go into the trap. It is a good idea to try on a few brands to see which one give you the best result. What type of bait do you need? For ants between wall cracks, you can use baits with a syringe to help you reach through the cracks. On the other hand, if you have kitchen ants, then an ant trap with stations would work best. How long will it take to kill the ants and how fast will it work? These are questions you should ask so that you know how long you have to wait to see results. Generally, it can take weeks to see noticeable results. Is the price worth it? How much do you think you would spend to eliminate your ant problem? Sometimes, pricier baits last longer and work faster than cheaper ones. Also take note that if the bait fails, you can always consult pest control company for further advice. Remove any food source that might confuse the ants. Instead of going to the bait, they might go to the food. Make sure the area is clean before setting up the ant bait. This can eliminate their confusion and went straight to the bait. Don’t use repellents near baits to prevent ants from coming to the bait. Do not randomly place the ant traps or over areas where ants directly went through. Lay the bait beside an ant trail so the ants can pick up the bait while traveling to their nest. Regularly check the baits and refill whenever they dry out or finish. Whenever possible, use a small plastic tray to hold the ant bait so you can easily move the bait to places that you need the most. Never leave any ant traps near or easily reachable by children and pets. While most of ant bait products have no expiry date but they will lose it effectiveness if left unused for too long. Always try a few brands to see which one is the most effective in exterminating the ants found in your home. Ants infestation will never end if the queen is alive. Only by killing the queen and the colony will end with it. If you are looking for ant traps safe for cats, dogs, or other home pets, then you should purchase one that keeps the bait inside an enclosed container. This will ensure that the pesticide is not exposed and your pets will not be able to access it. The WAANTRED and Terro ant trap are pet safe option you can use. Which ant trap to use depends on the type of ant infestation you have. Certain ant species prefer certain food or flavors. Fire ants or thief ants prefer a protein-rich bait while sugar ants prefer sweet bait. Read the packaging before you purchase because it will most likely state the kind of ant species it can kill. You should also know whether you will use the ant trap inside or outside your house. Waterproof ant traps were designed for outdoor use only. Although there are different types of ant traps available but mostly comes in various shapes and sizes, they typically have a food source to feed the ants in a small container. Outdoor types have the same feature also but they can be hung on trees or bird feeders and likely waterproof. Fighting off an ant infestation can be very annoying that’s why using the best ant traps is essential to eliminate as much ant varieties possible. A reliable ant trap with a strong bait is your best weapon against ants in your kitchen. In choosing a good ant trap, it’s important to consider how potent the bait is and if it is effective in killing the entire colony after just a few days. We like Maxforce Quantum and Advion Ant Gel because they can eliminate different kinds of ants and are very effective in reaching the entire ant colony.